Now that the kiddos are home from school on summer break, I’m sure you’re racking your brain trying to think of some new activities to do with them. 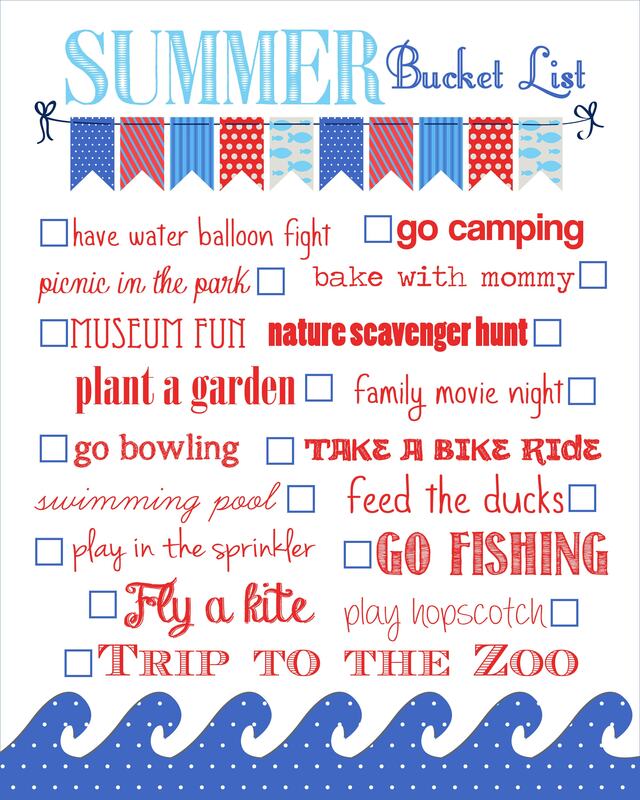 To keep it fun and exciting, here’s a fun little Summer Bucket List I created so the kids can pick something fun to do each week! 17 different activities are listed including lots of outdoor fun and some great ideas for the days that are rainy or too hot! As a working mom, I know that it can be a struggle to think of new, entertaining activities to do as a family. I thought this short list is a great way to get everyone excited and involved. 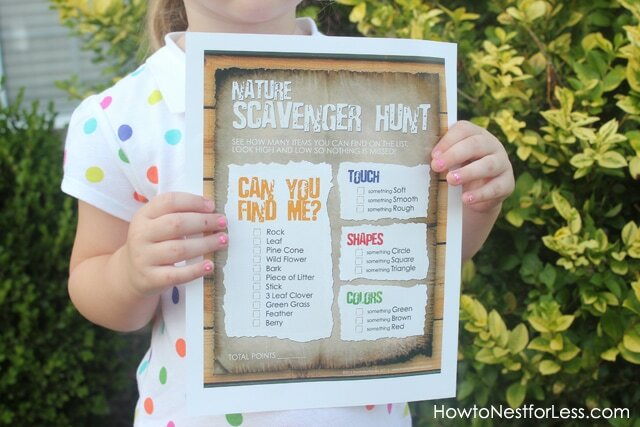 There is also a nature scavenger hunt printable below that you can use to get the kids thinking and being more creative. The idea is to put this Summer Bucket List printout in an 8×10 inch picture frame. You can use a dry erase marker on the glass to cross off the items on the list! Do some items more than once based on what attractions sound like a good time in your hometown. Also, one of the items on the list is a Nature Scavenger Hunt. You can grab the printable here and get the kids outside and exploring! My little ones love to take these to the park. They find multiple versions of the items on the list and see who finds the best item. I HOPE YOU ENJOY and have a fun, happy, and safe Summer! Don’t forget to send me pictures of your favorite adventures! QUESTIONS: What is your favorite summer bucket list idea for an activity you did with your kids? Comment below and we can create another bucket printable list together using your ideas! « Backyard Clean Up + $50 American Express Gift Card GIVEAWAY! Thank you so much for the free printable Summer Bucket List and the Nature Scavenger Hunt!! I am so excited to print and use them…..they made my day!! Aww, glad to hear Annie!! I cant download any bucket lists but the older version. What am I missing??? Love your designs! Right click on the image and save it to your desktop. Open that file and print. Hope that helps! Such a great list and so cute!! SUMMER BUCKET LIST rocks my socks!!! I just made a list like this for my family. I tried to get to 100 items, for “100 days of summer” but only managed 50, you’ve got a few things I’ve forgotten that I’ll add. What a fun way to keep track of your summer bucket list. Thanks for sharing on Merry Monday. Pinned.